"It's not the struggle that makes us artists, but Art that makes us struggle." For each success that I’ve had in my career there have been a dozen failures, setbacks and false starts. Like most people I don't talk about the setbacks very often. No one likes to relive their struggles. The paradox of social media is that as we become accustomed to projecting only the best parts of our lives for others to see we end up feeling more helpless, lonely and unhappy. For that reason I felt that it might be helpful to reflect on the hardships and challenges I face as an artist in the hope that those of you who read this and are facing similar challenges might feel a little less disconnected. In my conversations with other creatives I have discovered that there are three things that we all struggle with, regardless of where we are in our careers. In broad strokes, here they are and how they affect me on a daily basis. We all have a little voice inside of us that occasionally tells us we're not good enough. I spend a portion of each day listening to mine tell me that I have no talent, that I’m an imposter masquerading as an artist. It often can feel as if everyone else has the users manual for life except me and that at any moment someone will notice. We all face self-doubt from time to time. The cure for self-doubt is action. Action of any kind shifts the focus of your attention away from that little voice and toward the task at hand. Pick a project - nearly anything will do - and get to work. They say that the toughest part of going to the gym is putting on your gym shoes. Paradoxically the easiest part of any workout is putting on your gym shoes. So lace up, get busy and watch how quickly the self-doubt evaporates. Money. Those who have plenty often don’t appreciate its value. Those who have little can’t focus on anything else. Not a day goes by that money isn’t on my mind. Each month I wonder if the checks that come in will be sufficient to take care of my bills once again. I’ve had that fear every single day for over a decade. It can be paralyzing. To combat it, I do my best to live beneath my means and whenever possible I do what I can to help others in need. This makes me feel like a part of the solution. If you’re looking for advice, here’s what I have learned; it is easier to spend less than to make more. PRO TIP: Know your value, don't be afraid to ask for what you're really worth and pay close attention to your accounting. I use WAVE to track my invoices and expenses. It has been a powerful tool to keep my business finances on point. I recommend everyone at least give it a look. That said, the best system in the world is the one you will actually use so find one that works for you and start using it. For those of us without a 'typical' 9-5 work environment, meeting new people and forming new friendships can be challenging. Those friendships that came so easily in college become difficult to sustain as life grows more complicated. Often they fade away as people get married, have children and build lives around new priorities. I have many friends on social media but few that I interact with in daily life. Often I will go a week or two without seeing any close friends in person. In the past seven days the longest face-to-face conversation I’ve had with someone who’s not one of my students has been the girl who took my order for coffee yesterday. Making new friends you can relate to is tough. I get it. I overcome this by teaching and taking workshops whenever I can. Both offer the dual benefit of putting me in contact with new people and keeping me sharp. Take a class or enter a contest - it's the easiest way to find a group of motivated creatives and get into that group. The people you meet will challenge you to push yourself and try new things. You'll become a better artist as a result and form new friendships along the way. As they say, the struggle is real. We all face it every day. What's important is knowing that you aren't alone and developing strategies to cope with these challenges when they come knocking. 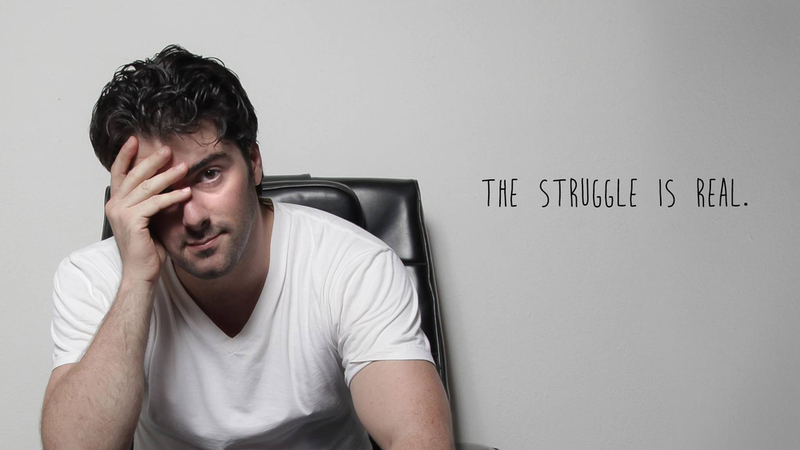 So, what struggles do you face in your career and how are you wrestling with them? Share your answers in the comments below.